The gastronomy of Barcelona relies heavily on fresh, locally grown fruits and vegetables, and fish from the Mediterranean. While some Catalan dishes are distinctive to the region, others incorporate traditions of Spain’s neighbors, Italy and France. In lieu of bread and butter, Catalans smother dense bread (sometimes toasted) with tomato rubbed on it at its peak of ripeness, fresh garlic, and olive oil to prepare pa amb tomàquet. Morning, noon or night, this national dish appears on almost every table. Pimentio de Padrón is a green pepper dish served fried and seasoned with coarse salt, often served tapas-style as an appetizer. The peppers are incredibly mild and sweet until you get a hot one that adds an element of surprise. Cava is a relatively inexpensive, sparkling wine that is extremely popular in Catalonia. Since 1870, winemakers have used the méthode champenoise (similar to the one used to make champagne in France). Most of the grapes are grown in lt Penedès, an area in the northeast of Spain. Jamón Ibérico de bellota, the precious ham of the Ibérico acorn-fed black pig, might be considered the Catalan equivalent of caviar. The cured meat is dark red and marbled (making it tender) with monounsaturated fats that have been shown to reduce cholesterol. For those with a sweet tooth, crema catalan is the Spanish equivalent of crème brûlée. This rich desert is made with milk, eggs, sugar, lemon or orange zest, and topped with caramelized sugar. Usually served in a ramekin, it can also be discovered in stuffed sweet pastries. 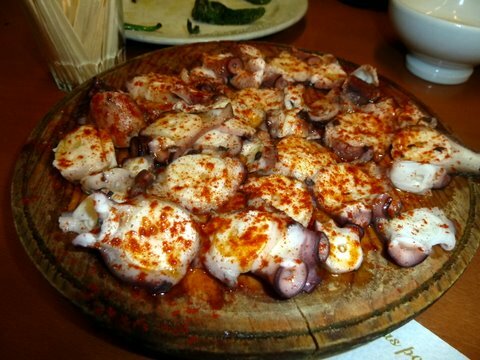 P. S. While it’s not exclusive to Catalonia, don’t miss the opportunity to try pulpo a feira, broiled Galician-style octopus seasoned with hot paprika (pimento picante), salt and olive oil, and traditionally served with potatoes on a wooden plate. Read more about foods from fellow bloggers on Marcia Maynes’ Foodie Tuesdays. I should not read things like this when I’m hungry! Can’t agree more that the food in Barcelona is something special! My favorite is the pa amb tomàquet. It is so easy to make but I never think of making it…maybe manana! One thing I do remember of my time in Barcelona is the food. Actually, whenever I think of Barcelona and Spain, food is the first thing that comes to mind. And yes, cava! I still have a few bottles from the case I took to Jamaica. Thanks for linking up this week, Irene! Oh memories came to life with this post. I loved that tomato and olive oil on the bread – served morning, noon and night and I could have eaten it that often as well! It’s one of the tastes of Barcelona that I’ve taken home with me, especially during tomato season! My parents are headed to Spain this week. I need to forward this to them since it’s such a good guide about the local cuisine. They will love the cuisine!